Randy's side of our swap arrived Monday and I have been remiss in not getting it posted sooner. Isn't it fabulous? As we had agreed upon, she made a small quilt with a log cabin theme, and then she made a wonderful, roomy tote bag with the quilt on the side. I couldn't be more thrilled! 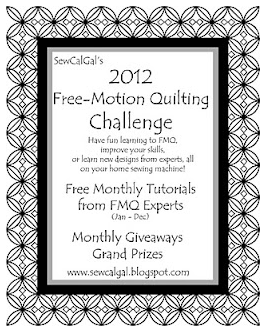 How fun will this be to take to quilt retreats and classes? It even has two pockets inside. It is definitely coming with me to my classes with Bonnie Hunter in July! Randy supplemented the fabric strips I sent her with some lovely pieces (and yes, Julie L., that is "that red" on the flip side). She also sent along a few other fun goodies--a couple of little project patterns, a sweet little needle book, and a Temecula pincushion kit for a Christmas Dresden. Oh, my goodness, those Dresdens are tiny! So cute! I may have to make a tiny Dresden quilt. Thank you so much, Randy. This has been a most surprising and satisfying swap! As to the "other stuff", I finished the 3rd little quilt I have made from leftovers from Mom's last quilt. I even used some of her leftover batting. She has always preferred poly batting, for ease of needling, and the way it puffs and makes the design stand out. And I must admit, it is easier to get tiny stitches with poly batting. You can see the stitches better by clicking on the photo below. It was waiting to have the binding and label stitched down. I also got the flimsy finished that I pieced from leftover squares from Mom's watercolor quilt and her postage stamp quilt. 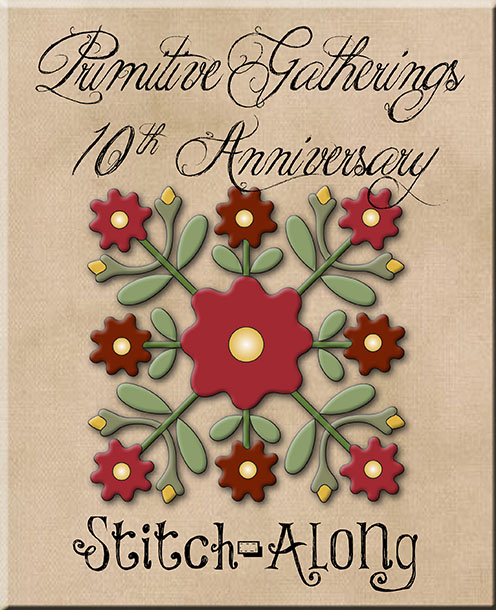 Obviously the corners have yet to be trimmed, but it is now off the design wall, because this is on it. I took pictures to Mom of several possible "memory quilt" options that I had saved to a Pinterest board of quick quilts. She chose this one for a quilt from Dad's blue plaid shirts. I've just thrown them up quickly and may do a little shifting around before I start stitching, but once I start shifting blocks I seem to get trapped in that loop and don't know how to get out. Anyway else struggle with that? I had more stitching time this week than I have had in a long time. I even managed to put some little purple 4-patches into a mini quilt top. These 4-patches have been languishing in my sewing room for many months. I have chosen patterns in which to use them on more than one occasion, but it has never clicked. I finally got this together after having to unpick an entire side, after webbing the top and discovering I had sewn on 1/3 of the top in an upside down position! Arrrgh!! I tried out a new-to-me gluten free recipe that hubby and I both enjoyed. Bakery Style Gluten Free Blueberry Muffins sure hit the spot! Wow that bag is fabulous! Bonnie Hunter Classes.......can I come too? Pretty pieces from your Mums goodies as is the quilt in motion from your Dad's shirts. Now this is the blog I see tiny blocks so why not some tiny Dresdens! Wishing you a happy weekend. What wonderful gifts and bag from your swap partner! The tote is a thing of beauty and a good size for classes. You will love Bonnie's class, too. The postage stamp quiltie looks great. And the shirt quilt of memories is a good one. I love the offset layout design, too. And Yes, once I start moving blocks around, it never ends. That is why I tend to let things simmer for a day or two on the design wall and only shift a few at a time. It usually ends up the first way I tried...lol. What an absolutely stunning tote--you two swappers are amazing! What a wonderful bag by Randy. I recognize that bee fabric on the side. It is Wisconsin fabric made by Jeanne Horton in 2014, the year we were in Wisconsin. I have some of it too. Glad you had such a fun swap. I love the design for your father's shirt quilt. You've been quite busy - that little purple quilt is so "you". What a delightful post! Another successful eye candy post! Love the log cabin bag. The quilt for Grandma looks wonderful. Yes, you and Randy both did very well in your swaps. I'll take either one! Love that little quilt from your Mom's blocks. And, I don't know what you mean by trapped in the loop - once I lay something out, that's it -HA! I think we drive ourselves crazy with layout of blocks. The rule is so true that if you move one block you move 10 and then you seem to be right back to where you were! And that little purple 4 patch with star is wonderful. How ca something so simple (4-patches) turn into something so beautiful? Love it! The tote is FAB! Randy was creative with her swap agreement with you. I never would have thought of doing that. I like what you are doing with your Dad's shirts. A memory in the making. That was a wonderful swap, for both you and Randy. I love what you have planned for your father's shirts. Your setting right now looks perfect in my eyes. What size did you make your triangle squares? Lots of sweet little projects in the works from your mom's quilt leftovers. You know me and purple - your quilt is adorable!! Randy was very clever to make a tote from a mini quilt. I never would have guessed that was how she broke the rules. LOL. Beautiful tote! What a great surprise use! Love the shirt block layout. I have been know to set a timer and quit moving blocks when it goes off sometimes another set of eyes will help find like fabrics touching. The mini purple quilt is adorable-sorry it took some undo/redo! The muffins look yummy. LOVE the log cabin bag, practical but super pretty! Your Dad's memory quilt is a very nice use of the fabric and great design. 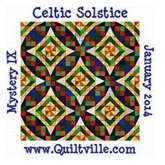 We were discussing "mens" quilts yesterday and I think this pattern is great, very straight forward but striking. Lots of nice finishes, but so glad to see another beautiful mini at the end! You and Randy had a fabulous swap with two beautiful projects. The tote bag will be a lovely addition to your collection of mini's. Your dad's memory quilt will be special for your whole family. Sorry you had to do some unsewing. Do you use a smaller stitch when you make a mini? WOW!! What a fun, fun surprise from Randy!! GREAT bag!! Your "Mom" projects are sure looking good!! Lovng the flimsy!! I am so glad to hear you are getting a bit more sewing time in!! One of these days for me - well, maybe and then again, maybe not!! LOL!! Ohh fantastaic works. I love them. That log cabin tote is incredible! Gorgeous!! Interesting observation about the poly batting and tinier stitches. When I first started quilting years ago, I used poly batting and had pretty tiny even stitches. More recently I use a cotton blend and my stitches aren't as pretty as they used to be, And I thought it had to do with age!!! Lol and it probably does.... but I will be trying poly again next time. Thanks for the tip!! What a fun bag! It is large enough to tote lots of goodies...I like it! My favorite little quilt you have shown is that purple with the yellow star...I just love it so much! I love your bag, and believe me...I spotted "that" red fabric when I saw it on Randy's blog post! Does she know that we covet that particular red? And is she hoarding some (do we need to go visit her?)? Great layout of the shirt quilt - and yes, I get into trouble when I start moving things around as well. Sometimes it's best to just leave it alone! Love the little purple quilt! Totally awesome tote bag! What a great swap the two of you made - you can really haul some goodies in there because it's so roomy! LOVE the plan for your dad's shirt quilt - very simple - but very striking too! Your little purple 4-patches are very sweet - I love that setting! Randy's tote bag is fabulous and I love the lining fabric almost as much as those precious log cabins on the outside! that Log Cabin bag is fabulous - Randy really sent you some lovely things.! Your blue shirt project layout is great. Nice little purple quilt. Reminds me of Jill she always loved purple. thanks for the link to the muffins. I'll have to try them. I'm delighted that you are enjoying the tote bag! I was so worried you'd be unhappy that I sort of interpreted the rules a little broadly! I love the layout using your dad's plaid shirts. I am sure your mom will be really happy with it. And the little purple mini?? ADORABLE, as always. Do you want some of that red fabric I put at the bottom of the "back" side of the bag? I am pretty sure I have more!! Never knew it was in demand!! Oh my goodnes - lots of lovely eyecandy! How clever is the bag from Randy?! And lovely assortment of wee gifs with it too! Great to see you making progress on your Mum's leftovers quilts plus the (future) quilt form your Dad's shirts looks great - yes, I do that too, spending ages shifting and re-shifting and organising and reorganising! (And still end up with similar fabrics next to each other!) The muffins look delicious - I find that to be a good site for recipes. Isn't that Randy something?! That's a great bag she made for you, Janet. It seems like you're making great progress with both your mom's leftover flower fabrics and your dad's shirts. I think I would hesitate to start shifting blocks in that quilt, too. I do it often -- this will look better here, but then were to put the block that was already there. One move requires 6 more and then.... I love that little purple quilt (even though purple is not my color). It is just charming. A whole bunch of randomness!